Chicory. It’s a weed, of course, nothing but a weed, sprouting up along roadsides, often growing right at the edge of the blacktop. It’s a particularly wiry, scraggly weed, with dandelion-like jagged leaves and a warty bumpy stem. It’s often sprayed by highway crews as they go about their midsummer massacre of plant life along guardrails and STOP signs. 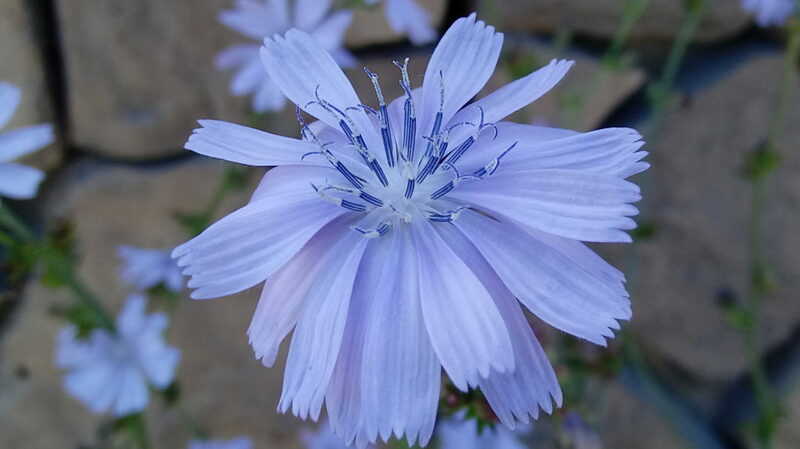 But when you take a moment to look at chicory up close, it’s a symphony in blue. Chicory is shy of flaunting its beauty—the blossoms are only open in the early part of the day, closing up as soon as the sun begins to head downhill. 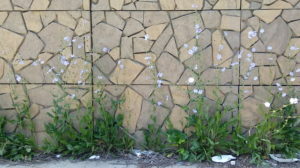 By evening the flowers are all tightly shut, and it’s just a raggedy roadside weed again. Chicory roots, as you’ve probably heard, can be used as an economical coffee substitute. There are tons of chicory plants out there, the roots free for the taking! Many a wild foods cookbook informs you to dig up chicory roots for a delicious beverage. But like much advice, this is easier said than done. It takes a fair amount of elbow grease to unearth even one root, yank it free of the web of clinging rootlets, and shake the dirt off. You need a few dozen to make a pot of coffee. And once the roots are dug, then the hard work starts in earnest. The wild edible food books casually mention that you need to wash the roots, then dry them in a low oven, then grate or grind them up. Again, easy to say. It’s a bit of a project to wash every speck of dirt out of the gnarly crevices of a chicory root, and then they have to be roasted in a low oven and finally ground up. It’s all a lot of good healthy exercise, no doubt; those who gather their food from the wild rarely get fat doing it. Chicory coffee, while mildly pleasant once you finally make it, will never replace Starbucks. But the beauty of chicory flowers? Anita, I drink chicory coffee all the time. I grew up drinking this coffee after the war in Germany. I was just a child when my grandmother made it for me for breakfast. It does not have the acid that regular coffee has, nor the caffeine. I also love the color of the chicory flowers, it is one of my favorite wildflowers. Interesting! I never thought of it as a coffee substitute for children. My Italian grandfather used to make me café au lait when I was a child, but he used real coffee.